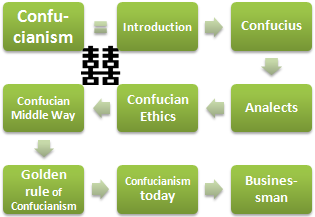 Syllabus of the Online Course (Subject) - Confucianism: Ethics and Business (China, Japan). 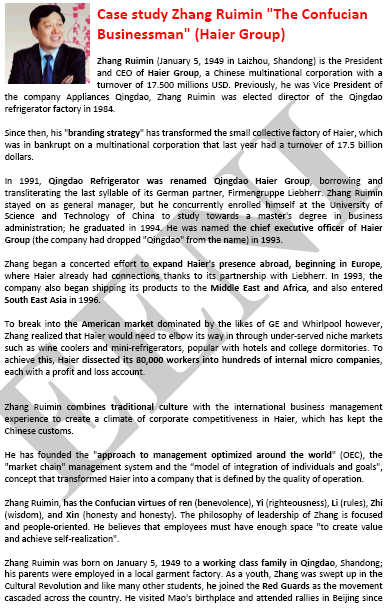 The students who have taken this module (Taoism and Confucianism) can validate and register for a Bachelor of Science, Master or Doctorate at EENI Business School & HA University. Methodology: e-learning (Online) / Distance Learning. 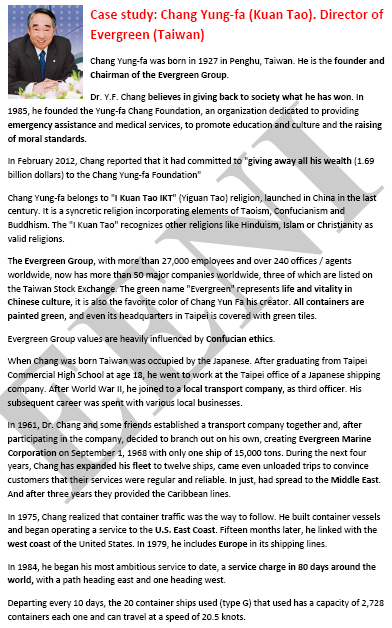 Area of Knowledge: Religions and Ethics - Asia. “Do not do unto others what you do not want others to do unto you” - Confucianist Golden Rule. Description of the Online Course - Confucianism: Ethics and Business. Kongzi, also called Kung-tse, to which the Jesuits put the name of Confucius, was born in 551 BCE in Kufow, in the State of Lu and died in 479 BCE at the age of 73. He was also known as the Wise or Master Kung (Kung-Fu-Tsu). Confucius was a contemporary to Laozi, Buddha, Deutero-Isaiah, Pythagoras, and Mahavira. The time of Confucius was the so-called the Age of Warring States (5th century to the 3rd century BCE) of the Chou dynasty (1122 - 256 CE) a ruined society, pigeon-holed in a feudal caste system and fragmented into small States in continuous war among themselves. The death and destruction were the usual scenarios of ordinary people; the society needed a new model. At this time came the so-called a “hundred schools” who advocated different philosophies, but only two have survived to the present day: Confucianism and Taoism. It is important to note that Confucius did not wish to create a new religion; he was first and foremost a reformer; he admitted to being an ordinary man. He wanted politically renew society, where the men pursue maximum happiness. Confucius believed in Heaven (Tsien) as something mysterious and impersonal acting in the world. He believed in the gods and spirits of the land. The Analects (Lun Yu, or “Sayings of Confucius” or “Philosophical Comments”) is the largest source of the Confucian thought, in the form of dialogues summarizes the essence of the doctrine of Confucius. Confucius was primarily a creator of a social system based on the tradition that has influenced the entire area of Sinic Civilisation: China, Korea, Japan, Vietnam, Singapore, Hong Kong, and Taiwan for over 2,500 years. The Confucianism has significantly influenced on the society in different spheres: political, economic, social, and cultural, as well as the mentality and way of life of all Chinese, even some foreign scholars consider the largest religion in China. Confucianism aims to help the development of human beings, does not seek salvation as in other faiths, but seeks the order, the wisdom, and the knowledge. Although the religion of China's communist regime is officially atheist and the Constitution guarantees freedom of religion, the Chinese practice different faiths (Confucianism, Taoism, Buddhism, Islam, Shamanism). 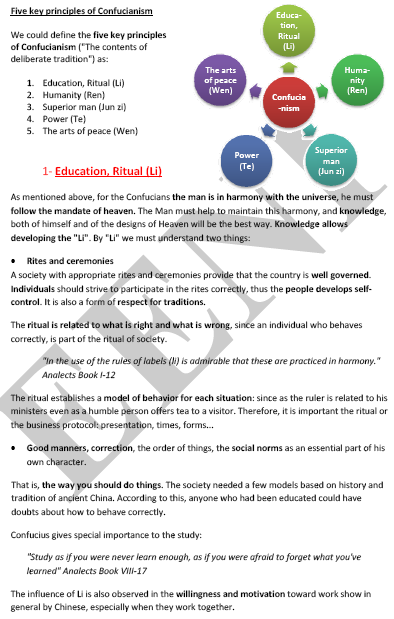 However, Confucianism, despite not being a formal religion in China; it is intensively practised in China and has influences on a very remarkable way in their culture and the form of negotiation of the Chinese people. Like any other religion that has had to live in a totalitarian state, Confucianism has always survived, and today is latent in the Chinese society. During the strongest period of communism in China was banned, but, as discussed below, its influence is latent on China today. The influence of Confucianism on the countries of Sinic Civilisation influence is somehow equivalent to the influence of the Greek philosophy and Christianity on the West.